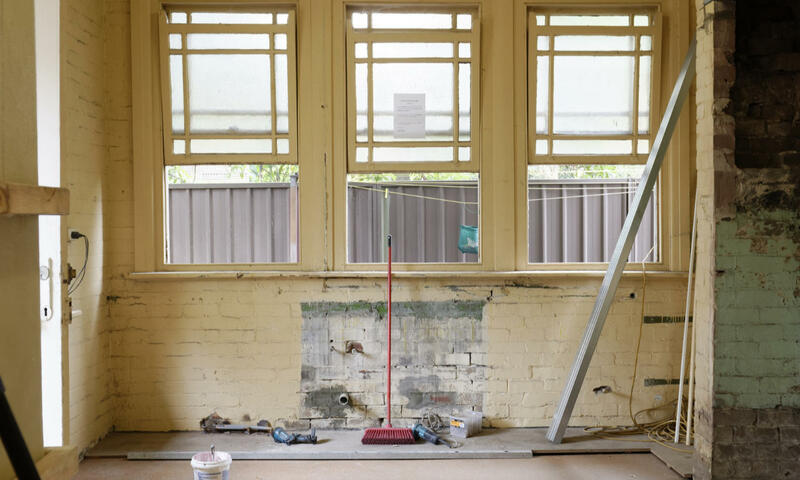 A project house that needs refurbishment is often an affordable way to get on the property ladder or to get a bigger house than you already have. But if you’re living there while you fix it up, problems like damp, dusty carpets, and tired décor can make your move feel less than thrilling. Redoing the wiring and getting an updated kitchen are something you might plan for the future, but for a few quick wins that will make the world of difference, try these tips! Many older homes actually have solid wood flooring hidden underneath the sad 1970s patterned pile. The fashion for wall-to-wall carpeting came during the middle of last century as a luxury in a coal-fire heated home. But with the advent of central heating, wooden floors are now a must-have feature. So rip up those asthma magnets and rejoice in your wood realness! A project house can often have damp porblems. The smell and health issues can be serious. Black mould can cause respiratory issues, and spores can affect asthma and allergies, which is especially dangerous for the very young or elderly. You might need a professional to help if the problem is too bad, but if you want to try to fix it yourself, make sure you use protective gear like dust masks to protect you against any particles stirred up and ventilate the area well (open the windows but shut the doors to prevent spores traveling). Fix the source of the problem first. Clean mould patches properly or they will just return twice as bad. Gently wipe the wall with a soapy cloth, then pat it dry with a fresh cloth, throw these cloths away in a sealed bin-bag. Vacuum and dry clean the soft furnishings around the area as spores can live in them. It’s not nice to think about vermin like mice or rats being in your home, but ignoring the problem could be dangerous to your health. Rodent faeces can contain Hantavirus, a nasty respiratory disease, along with other types of bug. And apart from anything else, it doesn’t feel good to share your house with unwanted guests! Go around dark corners with a torch and see if there are any indications of droppings, gnawed wood, nibbled food packets, or nests. Be sure to use your protective gear when cleaning up, including gloves and face masks. Seal up the holes where you think they are getting in. If poison’s not an option, for ethical or safety reasons (such as having pets or young children that might try to eat it) then get some humane traps and remove any catches as far away as you can reasonably go. It can be hard to see your ideal house underneath someone else’s well-established scheme, but there are plenty of home decoration simulator programmes available. You can simply point your phone’s camera at a wall to preview a colour scheme with Dulux’s Visualizer app, for example. Then go mad with a shopping spree with the Scandinavian Design Center UK! A project house can be a great investment, but making it feel like a home might take some time. Hopefully, these tips will help you get there faster. Glasgow estate agents can find you a project house! Find out the value or potential rental income of your property in less than 60 seconds. © 2019 Infiniti Properties. All Rights Reserved. Website design By: Jellydigio - Glasgow web designers.